Take advantage of your beautiful deck in nice weather by using these outdoor entertaining tips! Zoning is one way to ensure outdoor entertaining success! If you have a multi-floor deck, it naturally zones your space. A second floor deck has plenty of options for deck stairs that can elevate your space. For tall decks the two common options are traditional deck stairs and a spiral stair. Spiral stairs are the perfect option for a homeowner that wants to have as much entertainment space as possible. A single level patio has plenty of options as well. If you have one platform separate sections can be used for different purposes. You can zone your backyard by having decorative patterns built into the deck with the materials used. A simpler way to section off your deck is simply by the furniture used. Much like a small apartment, furniture can dictate the space’s purpose. Awnings and canopies are another great way to separate areas of your deck or patio without creating physical barriers. Some zones may have a permanent purpose, and others are more flexible. One common use of the different areas is to use one as a grilling and outdoor kitchen area while the dining and lounge areas are separate. By separating them, you can keep any smoke that may come your grill away from your guests’ conversations. An outdoor kitchen is a great option for those that don’t always want to grill, but don’t want to keep leaving the outdoor party to cook indoors. They can continue to be included in the conversation. Another popular option is to have a separate section where the kids can sit while their parents have their own area. The kids’ area can have a number of different entertainment options, such as oversized backyard games. This is great for family parties that have older children that want some independence. By giving them their own space on the deck or in the backyard, they are able to feel that they have some freedom. The adults can sit on the deck, relax, and keep an eye on them without hovering. You can create the setting you want by using the right lighting. The most popular backyard lighting option are torches. Commonly referred to as Tiki torches, they are mostly used around a pool or for island themed events. They are normally made of bamboo with a wick and container of flammable fluid. They have a few different design options, but they do have a very distinctive look that may not lend itself to every design aesthetic. If you’re backyard features a multi-floor deck and patio, deck stair lights are one way to illuminate your deck. 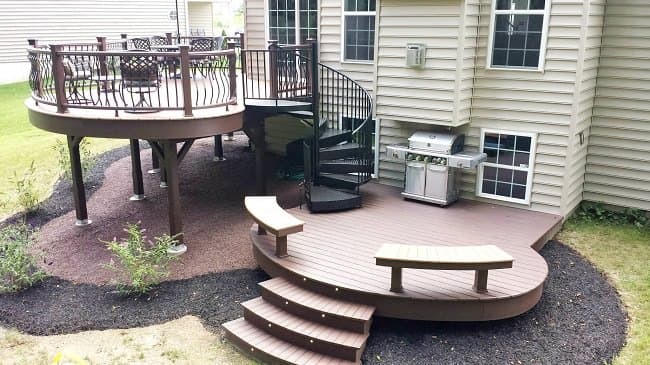 With this small addition, your deck stair becomes a multi-functional piece in your backyard. Not only is it your means of egress, but it also has a new decorative element. You can incorporate lights into the actual steps of your staircase. This creates a permanent lighting solution that has easy upkeep with a simple changed lightbulb. If you want to take a more flexible DIY approach, you can simply wrap string lights around your handrail. They can be taken down after your event or during bad weather. You can also switch out white lights for colors depending upon your theme or the season. Another less common lighting solution is to install outdoor wall sconces. Because they attach directly to your exterior wall, it takes up no actual deck space. This makes them a great option for tight spaces. Depending on your home design, the sconces can be as ornate or simple as you’d like. A DIY install will be difficult and you may want to leave it to an electrician or contractor. By using pieces that are typically found indoors, you are creating an outdoor living room for your guests. The warmth and hospitality that you can typically find in the interiors of your home have now extended to your outdoor event. Just because it’s an outdoor party doesn’t mean that it needs to be all neutrals and plain canvas! By adding pops of color, you can create the atmosphere of a full event. Seating is always an important factor when considering outdoor entertaining ideas. Why not kill two birds with one stone and fix your seating and color problems in one go? If your deck has built in benches, you can always paint and seal the lumber. You can also find colored plastic or wicker furniture. If you cannot find the color you want, you can easily paint those pieces. If you decide you want a less permanent pop of color, adding cushions is the option for you. Not only do these pillows add to your guests’ comfort, but they are an easy way to bring the indoors outside as well. The most important part of adding cushions to your outdoor seating is to choose the right fabric. Typically 100% acrylic fabrics, acrylic coated polyester and poly-cotton blends, and vinyl coated cotton are popular options for outdoor uses. They hold up well in different weather conditions and can easily be cleaned. If you can’t find the right fabric design and color combination for you, can always spray paint your cushions using an outdoor paint. If you have a multi-level deck, adding color to your deck stair is a more permanent way to add personality to your deck. If you have a traditional deck stair, you can stain and treat it to have a richer color. An aluminum powder coated spiral stair can be your standard black or white. However, if you have a bright house design, why not get a custom color? The powder coating process allows you to choose any color that matches your deck design dreams. A galvanized exterior spiral stair comes with a metallic silver finish. If you want a change after a while, your spiral stair can be painted after six months with the proper primer and paint. If you aim for a more understated look in your home, some more subtle touches of color may be best. Outdoor rugs can give a subtle color and elegance that you are looking for with your outdoor space. Not only is it another way to bring the indoors out on to your deck, but it can also help to zone your backyard space. They differ from an indoor rug by being element resistant. However, just because they are rugged enough to live outdoors doesn’t mean they don’t have elegance and beauty. There’s an extensive range of colors and designs depending upon where you look. 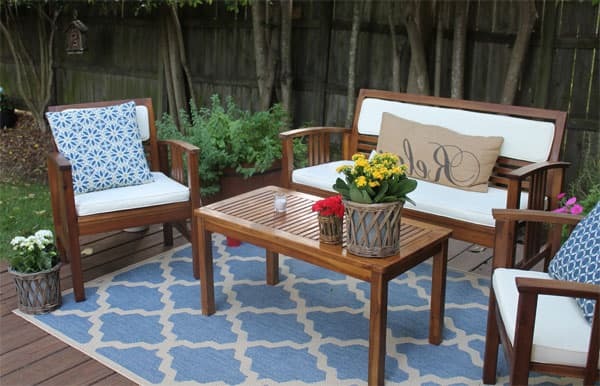 If you still can’t find the perfect rug for your deck, a DIY version is easy. Take a solid color outdoor rug and use spray paint and a stencil to create a piece that you love! Another small pop of color can be in your dinnerware! Unbreakable sets are perfect for outdoor entertaining when there is a lot of moving around and surfaces may not be as stable. Sets can include anything from plates to wine glasses and come in a myriad of colors and themes. If you want to keep the dinner ware itself clean and simple, you can always had accents through pitchers and serving bowls. When having any event at your home, whether outdoor or indoor, your guests’ comfort is the most important factor. Outdoor parties happen to have a few more factors to take care of than your indoor events. During the spring and summer months, bugs are common party crashers. One way to combat them is to take advantage of citronella products. These can include the previously mentioned tiki torches and table top candles. It’s also a good idea to keep bug sprays on hand for guests. If your event is during the day, having sunscreen available is a nice touch. You can have a range of SPF’s in order to accommodate to all of your guests. Safety is an important factor to keep your guests comfortable in your home. Lighting is the most important factor if your event is taking place at night. Whether your deck is a single level or multi-floor design, having non-slip surfaces is important. These become important if it has recently rained or your backyard features a pool. If your deck is made of lumber or composite decking material, it can often get slick when wet. There are coatings that you can apply to your deck in order to create a non-slip surface. There are deck mats that are often used around pools and hot tubs. These can all be applied to a wooden traditional stair as well. Spiral stairs often feature diamond plate treads which provide a non-skid design on each stair. If your deck features a full stair, a safety gate is something to consider. This is particularly important if you plan to have events with small children or if you have pets in the home. There are several different designs that can match your railing and stair materials. Outdoor entertaining can be stressful for the homeowner, but it doesn't have to be! These tips can help make outdoor entertaining easier. After creating a beautiful space, be sure to focus on your guests and what they might need during your summer party. By being prepared, you'll take away a lot of your stress the day of the party.